Selected for the 2nd time as the Best of Design by Modern Luxury publication. 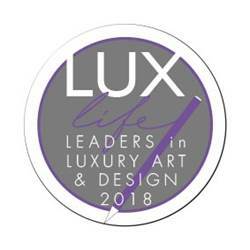 The Consulting House Inc has been awarded Best in Full Service Interior Design & Project Management 2018 as part of Lux Life Magazine 2018’s Leaders in Luxury Art and Design edition. The 2018’s Leaders in Luxury award highlights and commend only the best in the art and design industries and pays homage to the hardworking people behind these innovative creative firms – ranging from interior designers, landscape designers and artists to name but a few. Each recipient is hand-picked by an in-house research team, who have spent recent months examining and researching art and design firms from across the globe – ranging from the very best interior and exterior designers, to art studios. This proven approach ensures that we award on merit and not popularity, and recognize – simply – the very best in the business. Recognized as one of the Top 21 Interior Designers in Georgia Featured in LuxPad. I’m thrilled to let you know that the Porch Swing post you were featured in is now live! Your tips and beautiful image are valuable to our customers who are looking to add a porch swing to their home or change up the look of a swing they already have. Featured in the February 2017 issue of Modern Design magazine as one of the Atlanta Faces of Design. Link is Below. Interviewed for an interior design inspiration blog by Asmara and published 5/2/16 on all of the company's social media. The link to the interview is posted below. DESIGNER FOR HGTV SHOW - "AMERICA'S MOST DESPERATE KITCHENS"
Selected as the designer for the HGTV show " America's Most Desperate Kitchens" The show will be filmed in Mid February for a 4 day shoot. As the designer for the show, I created the kitchen layout, which included removing walls and a window, designing the cabinetry and some unique design features that will be part of the new kitchen, selecting all the products and materials, and accessorizing the space. Will post when the show airs and have a clip on my website. Check out my interview, Hot Interior Design Trends on Georgia State Homes, one of the top sites for Georgia real estate. Georgia State Homes also services North Carolina homes for sale and South Carolina real estate. The Bunch Real Estate Group, Inc.
We recently sold a house where one designer's touches made it stand out from the rest! It would be easy to assume that when you are looking from $1.5M - $3.0M, every house would have some wow factor. They do - the "wow" can just range from "ouch" to "ahhh". Atlanta Symphony Showhouse - Espresso Room & Wine Room Are Complete! 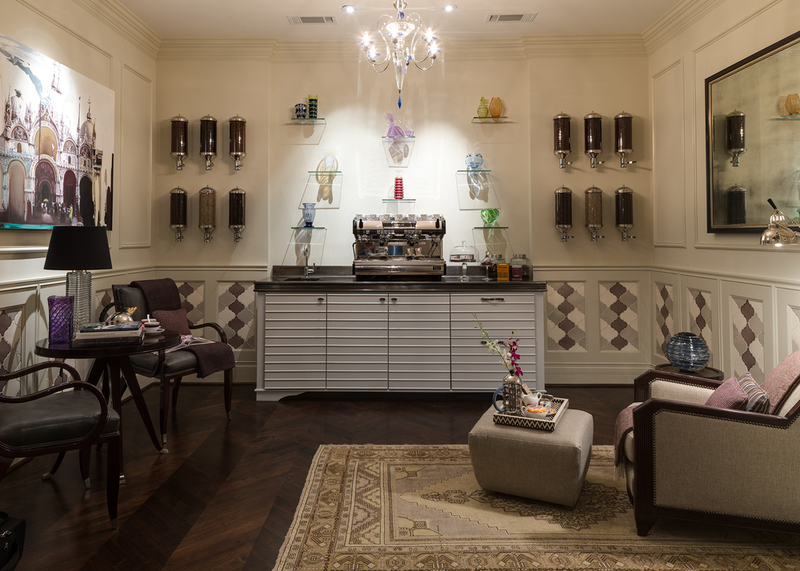 Espresso Room - This is the first time an espresso room has ever been designed for the symphony show house. My room was a shell of a space with concrete floors and wood studs and as a result i designed every element of this room. Given it was a small room, i opened up the room by creating a 9 foot wide cased opening. To stay true to a french cafe ambience i selected to have hardwood floors installed in a chevron pattern. The room was designed to have a hint of an art deco feel as the homeowner really liked that style. The design of the crown molding and all the trim was created to support that style without going too literal in order to maintain a softer feel for the space. The cabinet was custom designed as well as the pewter countertop and its decorative edge. The coffee silos were purchased directly from Turkey and it was quite an ordeal getting them through and picking them up from customs. The customs officials could not understand why 12 were needed if we weren't reselling them. The wainscot incorporated moorish style tile which is closely aligned to art deco and is reminiscent of what might be found in turkish coffee houses. I mixed the tile with wood for the wainscot as i felt it was much more interesting than an all tile or all wood wainscot. Also, the wood adds warmth back to the tile. The glass shelves are embedded into the wall to make them look as if they are floating. The espresso machine is a commercial grade machine and is a must have for finishing up the room. The homeowner had seen the chandelier months earlier and hoped to incorporate it somewhere in the house. Given its shape, color and style i felt i could make that happen for him in my room. Wine Room ( Gallery). This room was designed to have the wine become an art object in the home. This room was also a shell of a space. The espresso room was originally conceived to be the wine room. The homeowner did not want that large of a space dedicated to wine and was more interested in coffee and the concept of having an espresso room. He loved the idea of having wine stored in an unexpected place and an unexpected way. We carved an area out that had no defined purpose and decided to create a wine wall. There was a soffit that existed in the space and i extended that soffit out further into the room in order to create the illusion of having the wine area dug out of the room. To add to that illusion, i painted the entire area dark with the tile and cabinetry to closely match. The tile utilized on the back wall is a porcelain metallic to give some depth to the space. The racks were custom made in chrome to add a flash. Starfire glass encloses the space. I am pleased to have been selected to participate in the 2013 Atlanta Symphony Decorators Showhouse. I have been asked to design two rooms -- the Espresso Room and the Wine Room. Both rooms are shells and completely unfinished. I am designing every element to finish them out. The showhouse opens April 20, 2013 and runs through May 12, 2013. Below you can follow the progression of both rooms being built out. Enjoy! Espresso Room - In Process. 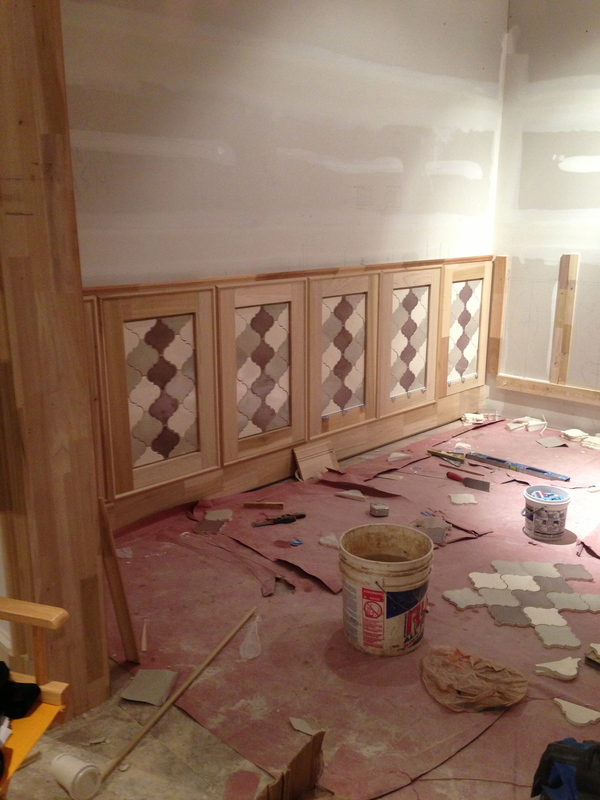 Building the wainscot with a tile insert and a detailed trim design. Espresso Room - In Process. The front wall where the cabinet will be located. Above the cabinet is the framework created to hold floating glass shelves. The walls on each side of the cabinet were brought out 4" and will hold the cylinder coffee bean silos. Espresso Room - In Process. Custom five piece crown molding being installed. Espresso Room - In Process. Applied molding being installed. Wine Room - In Process. 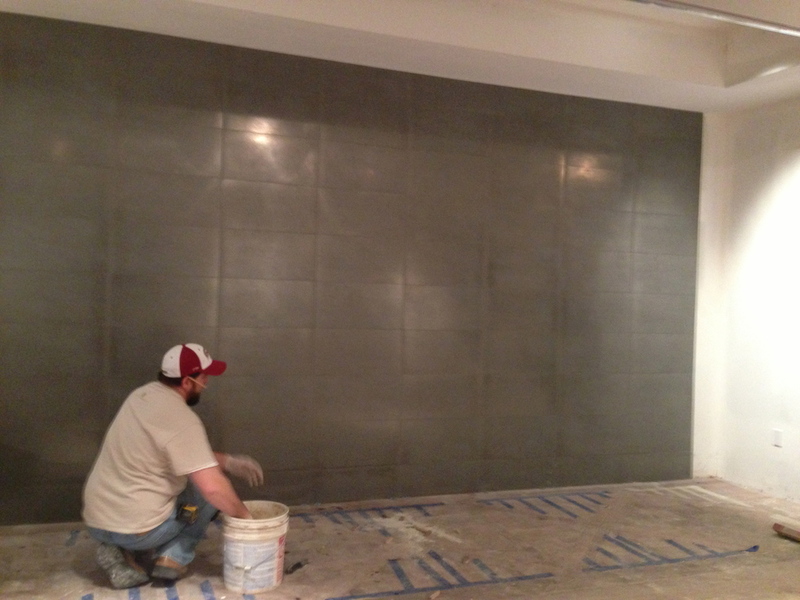 Metallic tile being installed on the back of the wine wall. I built out the soffit so that once the room is complete it will feel as if the space was "dug out." To celebrate the various holidays around the world I was selected along with a number of other interior designers to create a room vignette and table scape for an exhibition called Passport to Celebrations that was held at the Atlanta History Center from mid November 2012 - December 30, 2012. I was assigned the holiday Rosh Hashanah. I have attached some pictures of the vignette. I created a "mock" dining room and built the paneled walls to enclose my space. The wainscot is in a herringbone pattern. 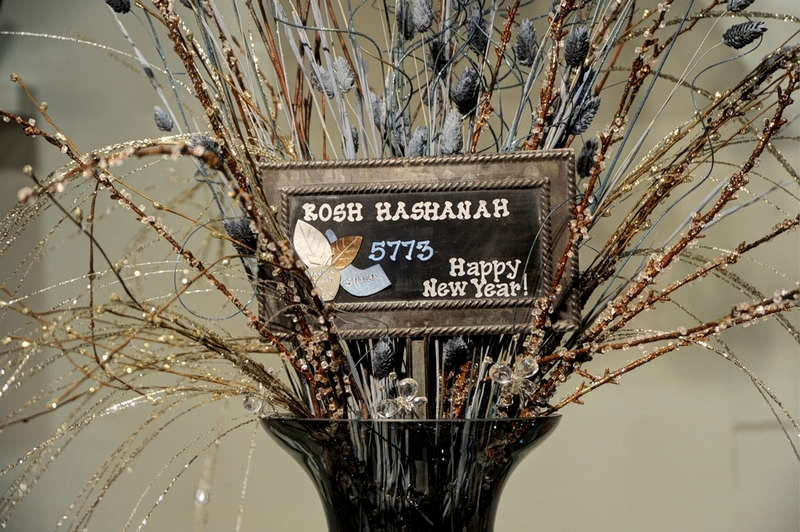 I created floating shelves to showcase some symbols of the holiday such as the shofar. 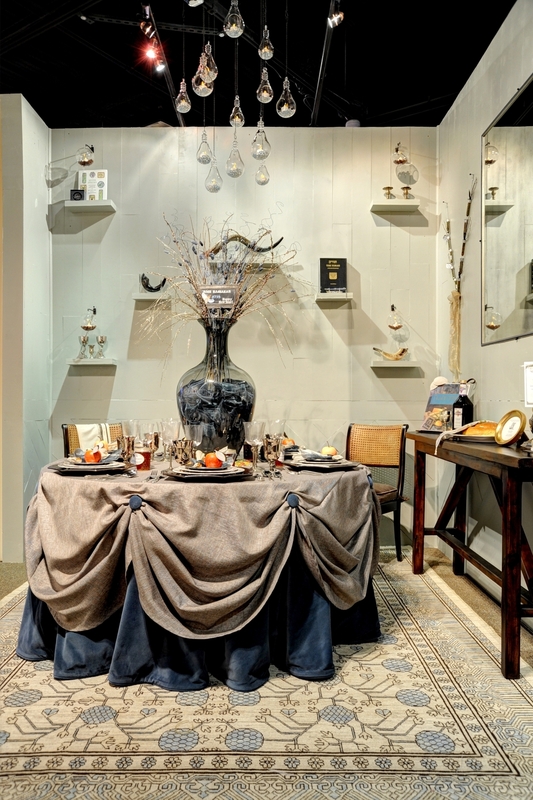 The table linens and the mirror were custom made for the event. The light fixture was put together with glass containers and were lit with votives reflecting off clear and colored beads.